For thousands of years, the angel has been regarded as a symbol of spiritualism, protection and goodness, as well as a bearer of joyful news! So share your joyful news and well wishes with your guests with our magnificent angel favors from the exclusive Choice Crystal by Fashioncraft line. These delightful angels aren't just for weddings and their lovely design makes them a great choice as first communion favors for girls too! Each crystal figurine is multifaceted and measures 2 1/8" x 3". These radiant crystal favors capture the ethereal and symbolic beauty of angels. Delicately packed in satin, each favor arrives inside a Crystal Choice signature silver heart design box, tied with an organza and satin bow with a crystal heart on top and an attached matching heart-shaped tag. Can I personalized it by putting our names and the date of our wedding? Unfortunately, personalization is not available for this item but you can order a personalized tag separately here. Hi. Do you have any favors can I put pictures? Hi Rachel, yes we have some favors where you can put your picture. You can click here for the list. Will this include the ribbon? Yes, each Crystal Angel favor arrives inside a Crystal Choice signature silver heart design box, tied with an organza and satin bow with a crystal heart on top and an attached matching heart-shaped tag. I wanted to to order 30 angels but can I change the tag to thank you with the date of my sons baptismal? 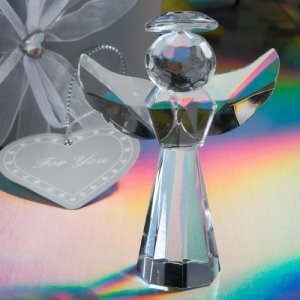 Unfortunately, the Crystal Angel Favor can't be personalized but we sell personalized tags separately click here.